The preferred travel companion of mountain guides, alpinists and outdoor adventurers worldwide, the Patagonia Black Hole Duffel 45L bag provides bombproof protection and sensible packing options for all your gear, and can take whatever abuse gets thrown at it. Made from burly Bluesign approved ripstop polyester with a waterproof TPU coating, it can take a beating from bad weather conditions, while the chunky outer daisy chains provide even more external storage options. Internally, the Black Hole Duffel has two mesh pockets in the lid for storing easy access essentials and internal luggage compression straps so you can fit even more stuff in there. An external zip pocket and removable padded shoulder strap complete the ensemble, while the best bit is that the bag has its own stuff sack it can be packed into, so you can compact it and pack it away when you don’t need it, genius! MATERIALS 15-oz 900-denier 100% polyester ripstop (50% solution-dyed) with a TPU-film laminate and a DWR (durable water repellent) finish. The Patagonia Black Hole Duffel has two internal compression straps that can be used to compact your clothes and hold them in place, giving you more room to fit in optional extras. The Patagonia Black Hole Duffel features an internal zip pocket that it an be compacted and packed into so it doesn’t take up too much space in your lodgings. 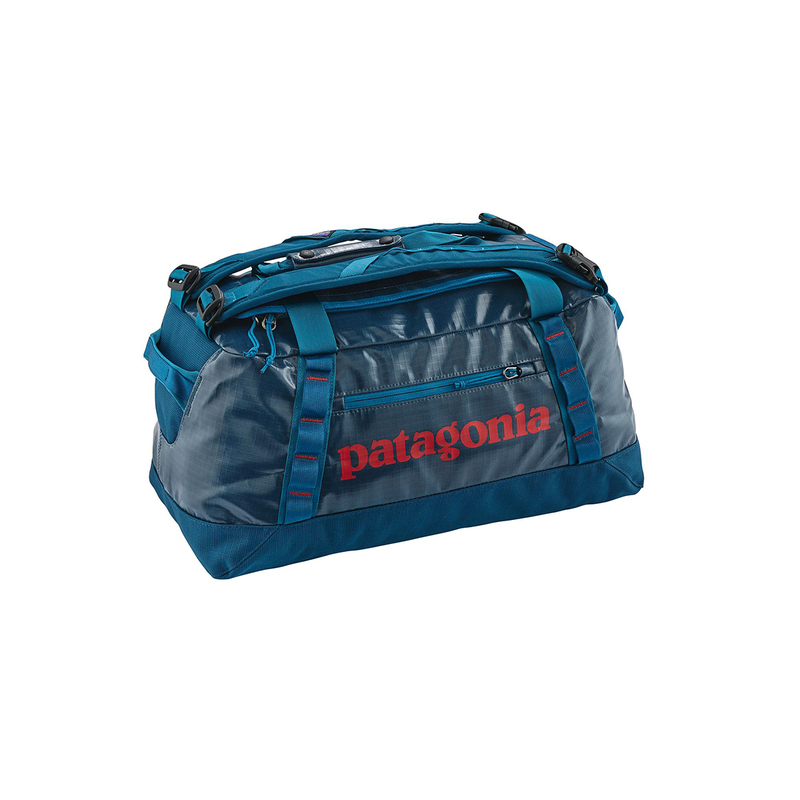 The Patagonia Black Hole Duffel is covered in a layer of TPU, which is a variation of plastic often used in high-end climbing and mountaineering boots. This makes it totally waterproof, as well as durable and is a great burly alternative to DWR. Bluesign is an international standard for fabric production, which ensures that stringent environmental, safety and efficiency standards are are met by any fabric bearing its logo. Bluesign fabrics use fewer chemicals, less water, safer processes and highly efficient manufacturing techniques to ensure that the creation of your new jacket, rope or backpack doesn’t destroy the world you hope to use it to enjoy.